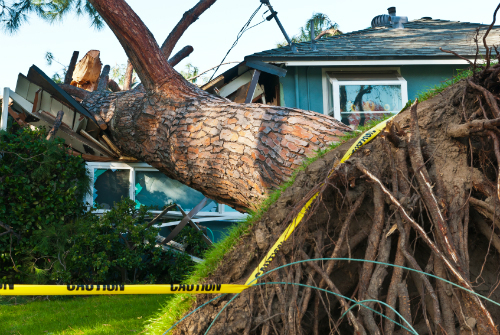 Short of having a tree crash through your attic, how do you know when to replace your roof? Here is a quick list of things to look for with different types of roofing. Take a trip to your attic. Can you see light coming in from the outside? Are there signs of water damage? Look for spots where the roof deck might be sagging. If you have a slate roof, look for signs of powdering. Refrain from walking on your roof, especially those with a steep slope or if it is made with tile or slate. Simply hop up on a ladder to check it out. Make sure to also view your entire roof from a distance – if there is a lot of damage to single area, it is likely an architectural problem, not a roofing one. When to Replace an Asphalt Roof? The main thing to look for with asphalt roofing is granule loss. Loose or missing shingles, curling edges or rot are also clear signs that roof replacement is near. Moss growth will shorten the lifespan of your roof, but it doesn’t necessarily indicate roof replacement. Clean it off to assess the shingles beneath. Algae growth, although unsightly, does not damage your roofing as it does not have a root system like moss. When to Replace a Wooden Roof? Wood roofing is highly variable due to the type of wood used, the thickness of cut and your climate. A few broken or missing shingles can likely be repaired, but you should look for more serious signs such as cracks developing on the edges of shingles, signs of rot or mold, graying colors indicating micro-fungal growth, damage from pests, and moss or plant life. When to Replace a Tile Roof? Clay tile roofing is very durable, yet also very fragile and likely to break if walked on. Poorly installed tiles are susceptible to slippage. As with wooden or asphalt shingles, singular tiles can be repaired by a qualified contractor. However, if 10 – 20% of your tiles are cracked or broken, it might be time for a do over. When to Replace a Fiberglass Roof? Over time, UV rays will degrade the material, leaving it looking dull and susceptible to cracking. A hail storm can leave pockmarks, and a feisty round of fireworks on Independence Day landing on your roof can also reduce its lifetime. When to Replace a Metal Roof? The rust proof coating can degrade over time on metal roofing, and should be maintained. 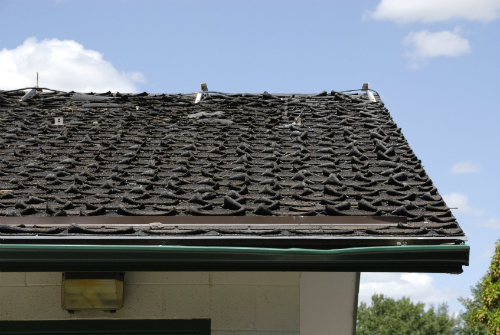 Extensive rust damage can indicate roof replacement, as well as holes, tears and cracks. When to Replace a Slate Roof? Slate roofing is rarely subject to an entire roof replacement. An annual inspection is prudent, as repairing small defects such as broken tiles or loose fastenings will ensure a long lasting roof. Two major signs of imminent roofing replacement are powdering on the underside and major delamination or flaking. Try the “knuckle test”: tap the slate at several different places. It should emit a clear, solid sound. If you hear a dull thud, roof replacement is in order. When to Replace a Rubber Roof? As with other flexible flat top roofing systems such as bitumen, the main problem with rubber roofing is trapped moisture, often from loose flashing or cracks. This is most easily seen in the summertime, as the water will heat up and create bubbles on your roof. If your roof is nearing the end of its life, contact a qualified contractor sooner rather than later. When you are literally dealing with the roof over your head, it is better to catch the problems before you have a swimming pool in your living room.